Tim Cousins sent in this photograph of a sign in a local mall in Dalian, northeast China. This is different from ambigrams, where one form simultaneously means the same thing (or roughly the same thing) in two different scripts, such as is illustrated here, here, and here. Nor is it the sort of virtuoso display where one script is redesigned to look like an entirely different script (the English alphabet made to seem as though it were devanagari or Hebrew script or even Chinese characters), as in this post (see also the comments for other examples). Nor is this the same as Xu Bing's Square Word Calligraphy, where the letters of English words are rearranged to look like Chinese characters. In the example under discussion, letters of the alphabet are manipulated to function more or less as strokes and components of Chinese characters. My Chinese friends and students who looked at this sign found it a bit hard to decipher, but after contemplating the writing for awhile, and with an awareness of the Guangzhou mall name in the back of their mind, were able to see how the letters all fit together to constitute four characters, though the letters do not "spell" anything intelligible in English or in Chinese. As I was preparing this post, I was so fixated on the black lettering on the yellow sign that I really didn't pay attention to the flamboyant word in orange on white background above it. I'll leave it to others to explicate (though I admit that it's fun to speculate on what it says). Is there any confusion on what the orange word says? Clearly 'Fashion', no? Right! If you search for 流行前线, you will find that its website address is http://www.pop-fashion.com, and it is just generally connected with the word "fashion". @Victor: "This is different from ambigrams". Great! You know fashun a lot better than I. This use of the word "ambigram" is new to me. I have known it for years as referring to a text that yields the same reading (or an opposite or otherwise related one) when rotated 180°, or reflected, or otherwise manipulated. Your third "here" link, the Google search for /david moser ambigram/, includes a number of those, such as this TRUE/FALSE and the four alchemical elements. The 前 was easy for me to read, but I couldn't begin to guess what the others were supposed to be. The fake 线 especially threw me off; I would have said the 戋-component was a japanese character of some type, like ぽ or も. Where's the D in the 前? It looks to me like a k, J, crossbar (I? ), N, and y. This is amazing. Gyaru moji in Japan sometimes uses individual Roman, Greek, or Cyrillic characters to represent kana (in full or in part, e.g. "ы" for "い" or "L|" for "を", but I've never seen them used as components in Chinese characters before. @Michael Watts: Start with a horizontal D with the straight line on top; push the horizontal top line to the right, deform the left side of the remaining "u" downwards. Glad it's interesting to everyone! I remember seeing kuruma 車 semantically annotated as カー. I also found it hard to read at first, when I tried to concentrate on the individual letters. But it became clear when I stepped back a few feet from my computer screen. Hm… the LanguageLog comment filter seems to discriminate by names. Tim, exactly. I was surprised to see 流行前线 translated as "Popular Front", since it says "Fashion FrontXXX" right there in the photo, although I couldn't see if it was front, frontier, or frontline. Any association with political cachets seems misplaced to me, since 流行 means "popular" in the fashion/pop-culture sense of the word, not the "of the people"/political sense of the word. I remember that you have had problems with "dainichi" before, but you used to use it years ago, if I recall correctly, and you didn't seem to have a problem back then. I rather liked that "dainichi" moniker. Could it be that the new LLog filters have been trained to reject anything that smacks of empire? But that is actually Dai Nippon 大日本, whereas Dainichi is the name of a Buddha, Mahāvairocana. 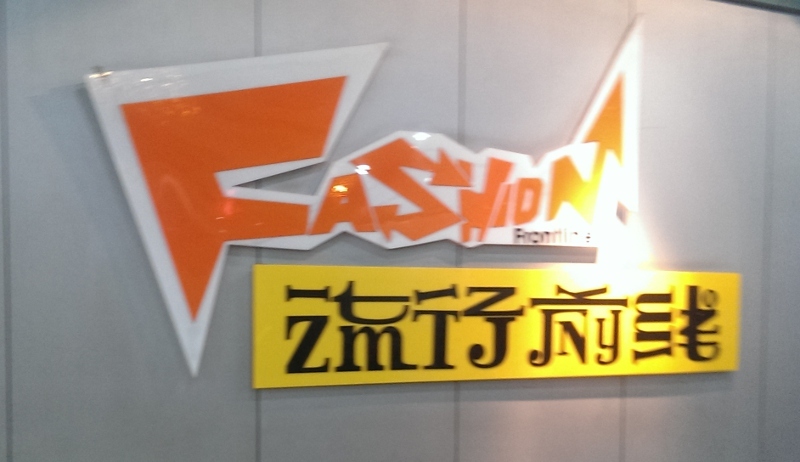 Be that as it may, what you say about Fashion Frontline makes sense, since this is clearly all about fashion, yet — for whatever reason — there seems to be a connection between the original / main Guangzhou mall store called 流行前线 and the English name "Popular Front". If you click on the second definition / translation there, viz., "popular front", you'll get additional documentation.